Pink Batts insulation is being promoted by Tasman Insulation in a New Zealand print advertising campaign, linked with the cold season. Models in PinkBatts costumes snuggle up to lucky customers on the couch, in bed and changing the lightbulb. Note the subdued browns conjuring up the dark winter feel, and the dog on the wool rug dressed in pink. 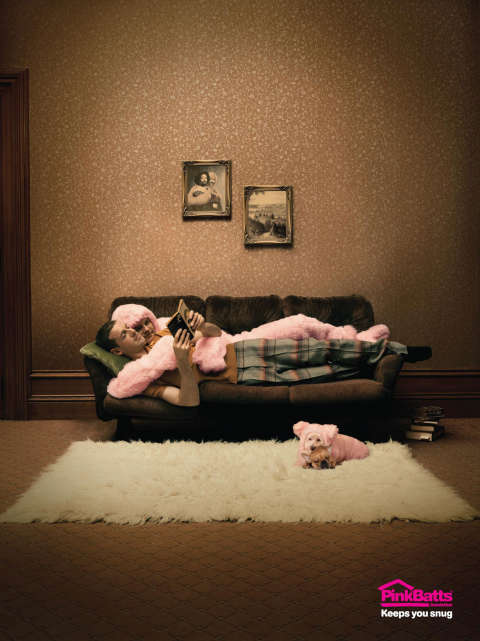 The PinkBatts Snug print campaign was developed at DDB New Zealand by executive creative director Toby Talbot, copywriter Christie Cooper, art director James Conner, photographer Rory Carter and retoucher Gordon Moir at The Lounge.